Photos for the Mirror by Christopher Shannon Most Outstanding Player Lamar Stevens (above) elevates over Utah defender Tyler Rawson for a jumper on his way to a game-high 28 points on Thursday night at Madison Square Garden. NEW YORK — Flavor Flav had his red cap flipped backward as he pulled out his iPhone on the Madison Square Garden court. Flav held the camera steady and recorded cousin Shep Garner clip the final strands of the championship net and wave it toward the Penn State die-hards. Flav’s T-shirt at the NIT said it all for the Nittany Lions: Believe the hype! 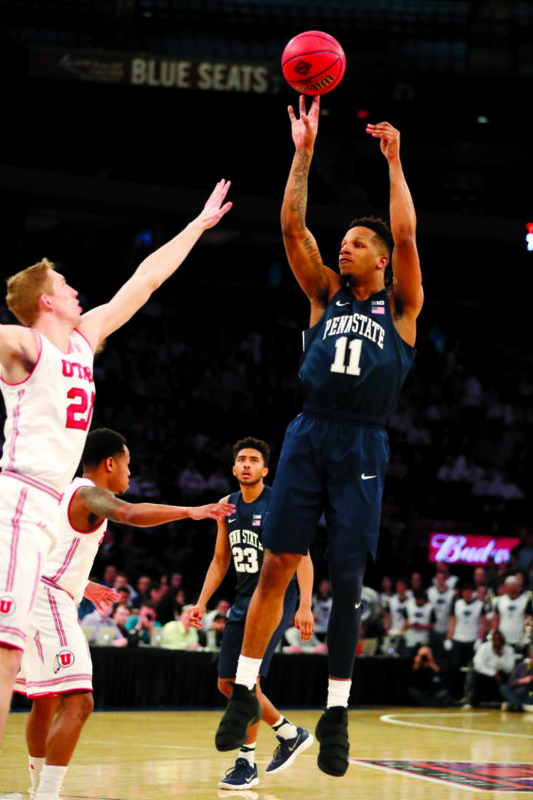 Garner hit the 3-pointer that brought rapper and reality star Flavor Flav to his feet and helped send Penn State on its way to an NIT title in an 82-66 victory over Utah on Thursday night. The fourth-seeded Nittany Lions (26-13) also knocked off No. 1 seed Notre Dame in the tournament en route to winning their first NIT title since 2009. “This means the whole world to me right now ,” Flavor Flav said. 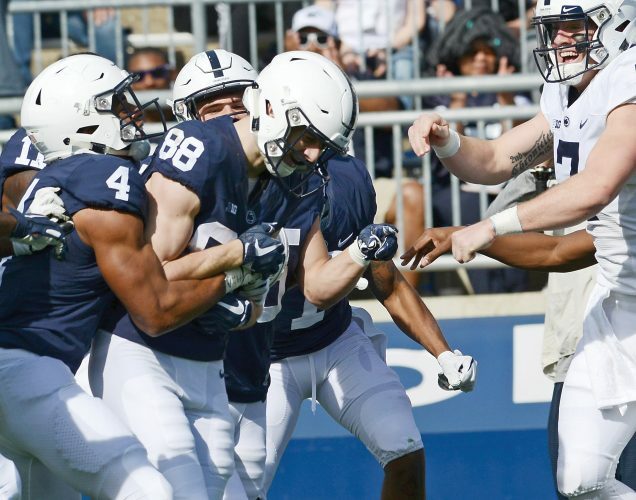 They were pretty pumped in Happy Valley, too. Flavor Flav, member of the seminal ’80s rap group Public Enemy, sang along to “Fight the Power” as it blasted in the Garden and had the PSU student section chanting “Flav! Flav! Flav!” as the Nittany Lions pulled away for a program-defining championship under coach Pat Chambers. Lamar Stevens scored 28 points, Josh Reaves had 18 and Tony Carr had 15 points and 14 assists for Penn State. Penn State’s Bryce Jordan Center has a long-standing reputation as one of the dreariest arenas in college basketball. Penn State fans, from rappers to silver-haired alumni, packed the Garden all the way to the last row of the upper deck. 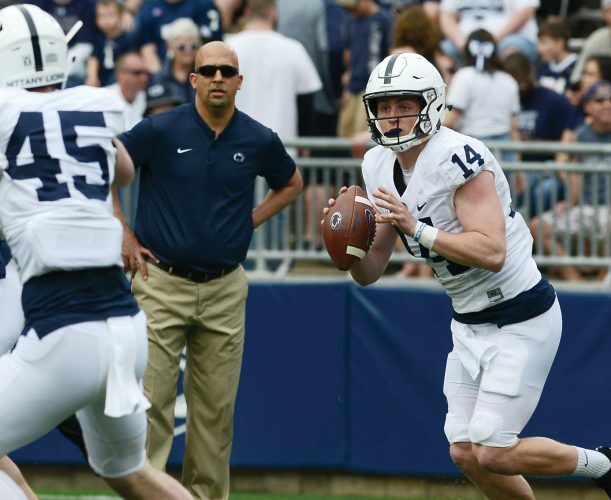 Penn State football coach James Franklin, who led the program to a Pinstripe Bowl victory in 2014, was in the house. Flavor Flav stole the show a few rows behind the PSU bench. Wearing a T-shirt that read “33 Shep Garner,” Flavor Flav danced all night in his seat. Flavor Flav popped his T-shirt and raised the roof in the same arena where Public Enemy once tore down the house. “I think we’ve proven to teams across the country that Penn State basketball is here to stay,” Chambers said. The clutch moment came in the third quarter when Garner — who became Penn State’s career 3-point leader in the tournament run — hit a 3 for his first basket of the game and a 49-41 lead that had the fans going wild. Reaves hit a crashing layup on a three-point play that stretched the lead to 11 and Stevens wagged his tongue toward the PSU fans on a jumper that helped blow open the game. Flavor Flav raised an arm in the air when Garner sank a 3 early in the fourth for a 68-49 edge that all but put this one away. Sedrick Barefield hit six 3s and scored 22 points for second-seeded Utah (23-12). Utah: David Collette, Justin Bibbins and Tyler Rawson are among the seniors moving on. … Bibbins scored 15 points. Penn State: Stevens reached 1,000 career points was named most outstanding player. … Chambers, a former assistant coach under Jay Wright at Villanova, took over in 2011 and has struggled to find any kind of regular success. The Nittany Lions have never made the NCAA Tournament under Chambers and they’ll have just their second winning record in seven seasons. But Penn State’s 26 wins are second-highest in program history. The Nittany Lions won a record 27 games in 2008-09. The 11,175 fans at MSG were the most for an NIT final since 2005. “And you say we’re a football school,” Chambers cracked. The NIT was a bit of a mad scientist in the college basketball lab. The game featured four 10-minute quarters. The tournament also implemented the FIBA 3-point line (22 feet, 1.75 inches), NBA-width lane of 16 inches, and a 20-second shot clock following offensive rebounds. PENN ST. (26-13): Stevens 11-15 2-3 28, Harrar 3-4 1-2 7, Reaves 8-13 1-1 18, Garner 2-6 2-2 8, Carr 5-16 3-3 15, Moore 3-3 0-0 6, Zemgulis 0-0 0-0 0, Buttrick 0-0 0-0 0, Wheeler 0-1 0-0 0. Totals 32-58 9-11 82. UTAH (23-12): Rawson 4-9 1-1 11, Collette 2-5 0-0 4, Bibbins 4-12 5-6 15, Barefield 8-11 0-0 22, Bealer 0-3 0-0 0, Jokl 0-1 0-0 0, Seeley 0-0 0-0 0, Tillman 3-7 0-2 6, Johnson 4-8 0-0 8, Van Dyke 0-2 0-0 0, Connor 0-0 0-0 0, Rydalch 0-0 0-0 0, Popoola 0-0 0-0 0, Caldwell 0-0 0-0 0. Totals 25-58 6-9 66. 3-Point Goals–Penn St. 9-22 (Stevens 4-5, Garner 2-6, Carr 2-7, Reaves 1-3, Wheeler 0-1), Utah 10-24 (Barefield 6-8, Rawson 2-5, Bibbins 2-6, Van Dyke 0-2, Bealer 0-3). Fouled Out–None. Rebounds–Penn St. 33 (Harrar 12), Utah 23 (Tillman 6). Assists–Penn St. 22 (Carr 14), Utah 13 (Bibbins 4). Total Fouls–Penn St. 13, Utah 14. A–11,175 (19,812).